is now CLOSED. We thank all those who sat for the examinations. Q1. When do advertisements announcing admission to the courses appear? Ans: The advertisements are released in the month of March-end/April-begining each year. Q2. Is there any minimum educational qualification or minimum percentage required in graduation to apply for this course? Ans: Graduates with a minimum of 45% marks can apply. The 45% requirement can be waived off if the applicant has work experience – preferably in content/media industry. Q3. Can undergraduates apply for this course? Ans: Those appearing for their Graduate final year examination can apply. In case they are selected then their admission is subject to furnishing of their final marks-sheet and/or provisional degree before end of 2017. No exceptions will be made to this rule. Q4. Is there any minimum/maximum age limit to apply for this course? Ans: The applicants have to be minimum graduates or those about to get their graduation degree in 2017. The maximum age is 28 years, but exceptions can be made for those with good academic record and/or relevant work experience – preferably in media/content. However, in such cases the maximum age limit will be 30 years. Q5. What is the fee for the entire course? What is the installment break-up and mode of payment? Ans: The details of fees and installments and mode of payment are given in the relevant section on Admission & Fees. Q6. Does your institute offer education loans? Ans: Our institute does not provide education loans. However, leading government and private banks, including HDFC Credila do offer education loans to our students. Q7. Are there any scholarships for students? Ans: There are no scholarships, but the top three rank holders are awarded merit certificates. Q8. Are Times Group employee’s relatives - son/daughter/brother/sister - eligible for admission? Is there any reservation for them? Are they given any special benefit in terms of lower fees/scholarships etc? Do such students after passing out get preference for jobs at Times Group companies? Ans: We do not discriminate between Times Group and non-Times Group when it comes to admission and/or fees etc. Times Group employee’s relatives have no reservation and their appointment to any Times Group companies post completion of course is subject to case-to-case approval from the CEO of Bennett Coleman & Company Limited – the main holding company for Times Group. Q9. Where is the Institute located? Q10. Is there any hostel facility provided by your Institute? Ans: The institute does not own or operate any hostel. However, since the past two decades, a number of residential houses nearby have been offering rooms or paying-guest options to students for a charge – which many of our students avail of each year. In case a student wants accommodation, our administrative staff will extend all help necessary. Q11. What are the timings of the institute and what is the minimum attendance required to sit for the exams? Ans: The teaching hours span from 9:30 AM to 6:30 PM on weekdays and 9:30 AM to 2:00 PM on Saturdays. The weekly holiday is on Sunday. Students have to have a minimum attendance of 80% for being eligible to sit for the final examinations. Only in serious medical cases can the minimum criteria be relaxed - but only on a case-to-case basis. Q12. What is the process of cancellation? Ans: All cancellations have to communicated to us through written application. 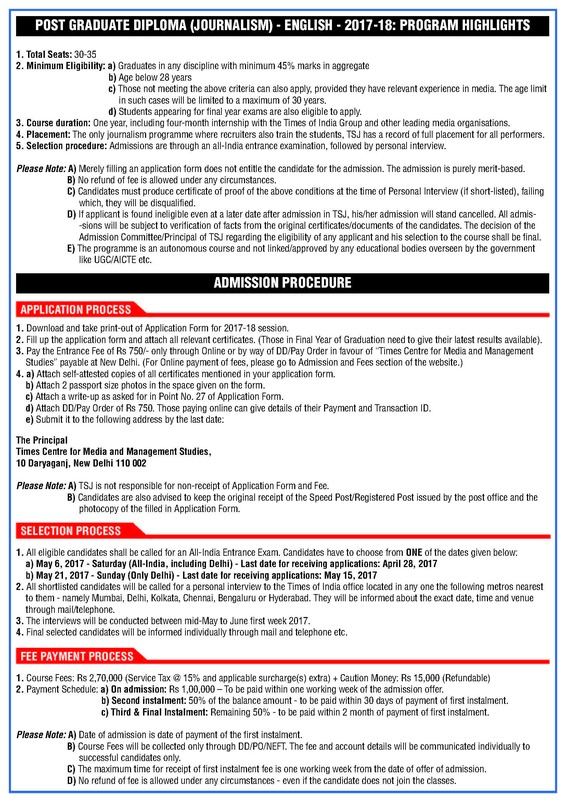 Please read relevant section under Admission & Fees. Q13. What are the fee refund rules? Ans: Please read the relevant section under Admission & Fees. As a rule, no refund of any fees is made. Q14. Will there be a separate entrance exam for the specialization offered – ie – Business, Sports, General or Entertainment & Lifestyle? Can a student sit for all these exams? Ans: There will be a single general exam for all applicants which will be for 3.5 hours in two parts - Part A of 2.5 hours and Part B of 1 hour. Part A will test candidates on their knowledge, usage and structuring of English - including their command of language, comprehension, writing skills etc to be tested on news, events and other topics etc. Part B will comprise of general knowledge, current affairs, logical and lateral thinking etc. Q15. How long is the entrance exam? Where will it be held? What is the pattern of the examination? Ans: The exam will be of 3.5 hours duration. Part A of Answer Sheet will be English and Part B will be General Knowledge and Current Affairs. Q16. How will the students know if they are selected for interview and finally the course? Will the student be required to go to Delhi for the interview? Ans: All successful candidates clearing the entrance exam will be called for interview. Only successful candidates will be called individually through telephone, e-mail and registered post/courier. Those clearing the interview will be offered admission. Outstation candidates need not visit Delhi for the interview. They have a choice of appearing for the same at the metro nearest to them, namely Kolkata, Bangalore or Mumbai. The interview will be done at the Times of India Group offices by senior editorial representatives of that particular centre. In case the candidate cannot appear for the interview due to certain exigencies, then based on a written request we may consider conducting the interview through video-conference. Q17. What is so special about the programme run by your institute? Ans. The programme is run by Times Group – India’s largest media house with presence in all media platforms and spanning the entire length and breadth of India. The flagship daily newspaper of the group – The Times of India – is world’s largest English daily with 55 small and big editions, while its sister publication – The Economic Times, is world’s second-largest English Business daily. Our Hindi daily – The Navbharat Times, is Delhi and Mumbai’s largest read Hindi newspaper. Apart from this, the Times Group also publishes the Mirror tabloids and 3 regional language dailies - Ei Samay, Vijay Karnataka and NavGujarat Samay. The Times Group is also present in broadcast through Times Now, ET Now, Zoom TV, Movies Now, Radio Mirchi, Absolute Radio (UK) and has a robust market share in online and other old/new media business like outdoor displays, event management, music, movies, books etc. The programmes we run are integrated with these businesses – which means that not only do our in-house experts teach their trade to students in classrooms, but also do mentoring with individual guidance for each student when they go for their 4-month internship at various Times Group and select other mainstream media brands entities across India. This internship exposure of working with some of world’s largest brands and getting trained by the best in the business is not offered by any other media/non-media owned media/journalism school. Q18. For how many years are these programmes running? Ans: The first programme (PG Diploma – Social Journalism) was run by Times Group in 1985. Since then the institute has conducted programmes not only in journalism, but also media marketing, sales and private equity. Q19. What is the level of the course and how long does it run? Are there any part time courses also run by your Institute? Ans: We offer only full-time year-long PG Diplomas which is a mix of academic training and intensive hands-on training with Times Group /other media brands – in any location of their choice. Presently we do not have any part-time programmes. Q20. What is the batch size? Ans: The average batch size is between 30 and 35 students. This policy of limiting the batch size ensures that not only do the best of the applicants get selected, but also the class is manageable wherein each student gets individual attention – in classroom or when doing internship. This is unlike other media schools where often there is no real connection to any media businesses – making them run purely for profit - with batches of over 200 students but having no hands-on training or internship offered to students. This is akin to learn how to swim or drive a vehicle only through classroom teaching. Q21. Who are your faculty? Ans: Working professionals from Times Group and other media companies, top-notch professionals from various industries, academic gurus from other renowned institutions and various other experts teach and also mentor students in the art of journalism. Please see relevant section on Faculty for more details. Q22. Are these course affiliated/recognized by university/AICTE/state government etc? Ans: The programmes are not affiliated/recognized by any government body. However, students who complete these industry-oriented programmes are always in high demand across media and non-media companies due to the fact that India’s largest media house – The Times Group – has been running these programmes for over 3 decades now. Q23. How many papers you cover during the entire course? What is the course curriculum and academic calendar? Ans: Please read Programme details for more information. Q24. Is there any specialization module like Broadcast/Online etc that is provided by your Institute? Ans: We specialise in "Integrated Journalism" and therefore train all students equally in all major media platforms – Print, Broadcast, New Media, etc,. This makes them a complete journalist - ready for any media they choose to join. Q25. What subject specialization do you offer? Q26. What are the job prospects/placements assistance for the course? What is the entry level salary after doing this course? Ans: All students have to do the 3 month internship as part of the course curriculum. Those who outperform are offered jobs at Times Group brands like Times of India, Economic Times, ET Now, timesofindia.com, economictimes.com and other media/content management brands even before they embark on their internships. For beginners the entry-level salary ranges from 3.0-5.0 lakh per annum. Those with prior work experience or those who choose to join non-media companies after doing this course, the salary can be almost double or more than what the beginners are being offered. Needless to say, salaries are also a function of general economic conditions and health of media industry and hence these figures are only indicative. The actual salary can be higher or lower than what is mentioned above. The alumni of our institutes who have done programmes in marketing, sales or journalism are today placed in several senior positions across media and non-media companies. Please read the section on Alumni for more details. Q27. What happens if a student does internship from any Times Group brand but does not get a job offer? In short, why should Times Group competitors give jobs to TSJ students then? Ans: Even though our institute does not guarantee jobs – primarily because we are not a job-placement agency but a training school, our students are much sought-after in the industry due to their high level of training and experience in real-life conditions. We strongly believe in the culture of co-creation through practical hands-on training and that we are in the business of creating top-notch media professionals – who go on to work in not only Times group brands, but other competing media and non-media companies. Some of our students also opt for higher studies or even start their own businesses. To create such professionals we give individual guidance and attention and that’s why our batch size is almost one-fifth of the size of other journalism programmes run by leading media/non-media companies. As Times Group brands may not always have adequate junior-level vacancies in the centres being sought after by the student, so only those who outperform get job offers. However, the training imparted by our faculty – which not only comprises of the cream of senior Times Group journalists, but also other competing media companies – means our students find readily acceptability in other places even if they are not offered jobs by Times Group. Q28. Is internship meant for all? If jobs are not guaranteed, then why is internship at Times Group mandatory? Ans: Internship is part of course curriculum and only those who complete the internship are eligible for the Diploma. However, poor academic performance, inadequate attendance, indiscipline, failure to work as part of team, insubordination or bad behavior towards staff, faculty or other students will mean termination of internship – which can be effective prior to start or during the internship period, thereby making the student ineligible for the Diploma. In exceptional cases, the student can be suspended after warning and in severe cases can even be expelled from the course. In case a student is not found fit for internship or the internship is terminated anytime during the internship period, then the student will be eligible for only a Diploma/Certificate without internship experience. The opportunity to interact and learn directly at the newsrooms of India’s leading media brands during the classroom training, which is followed by several months of continuous internship at location and a brand chosen by the students, is in itself an invaluable experience – which most media/non-media run schools do not offer. If a student gets a confirmed job-offer from any mainstream media company as a journalist at the start of or during the internship period, then the pre-condition of completing the full internship period can be dispensed with. Q29. 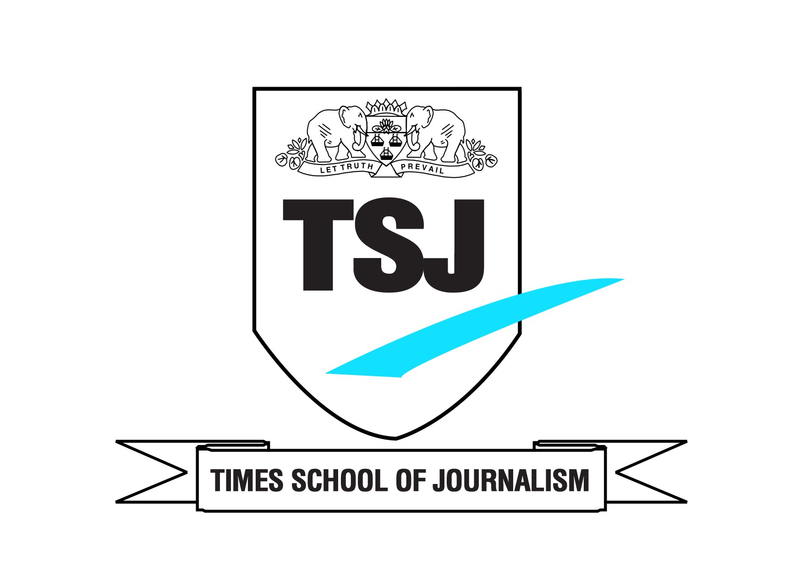 Which are the media companies where TSJ students work or get placed? Q30. Does this programme count if after passing out a student wants to pursue higher studies in India or abroad? Ans: The PG Diplomas offered by the Times Group are readily accepted by domestic private colleges/institutes. In international arena, our diplomas are sought after and many of our ex-students routinely apply for and get selected by top-notch education institutes like Columbia School of Journalism, London School of Economics, INSEAD, Singapore National University, etc..